Two bills in the Florida legislature would add workplace protections for LGBTQ individuals, but activists say one could be a step forward while the other could be a step back. "Radio version of this story that aired on Capital Report 2/22/2019." Equality Florida estimates 60 percent of Floridians are covered by local human rights ordinances. But there is no state-wide law that will protect someone from getting fired if they are gay or transgender. Republican Senator Joe Gruters is concerned by the slow progress. He’s drafted a bill called the Florida Inclusive Workforce Act and says the issue should be bi-partisan. “I would look at this as less of a party issue and more of a generational issue. I think most people under fifty understand where we’re at and are comfortable. I think we just have to continue to reach out and move the ball forward on these type of issues,” says Gruters. But his bill only focuses on workplace protections. “I will tell you I was a sponsor of the Competitive Workforce Act for the last two years while I was a House member, which included provisions relating to housing and public accommodations and public accommodations is probably the toughest thing, that’s the bathroom issue. And so my goal was to remove all that and try to focus on employment,” says Gruters. Efforts to bring more expansive protections have failed in recent years. The Competitive Workforce Act provides blanket protections for sexual orientation and gender identity and has been backed by more than 450 Florida businesses. It was last heard before a senate judiciary committee in 2016. But lawmakers like Republican Jeff Brandes struggled at the time with part of the measure that bars discrimination in certain types of public facilities. “Someone with male parts. Would they be able to undress under your bill in a female locker room, in a gym as a public accommodation?” says Brandes. The bill was struck down and hasn’t been taken up for the past three years, despite being filed every year, including this one. Shannon Minter is the Legal Director for the National Center for Lesbian Rights. He says although progress has been slow, Gruters’ plan to add protection for only the workplace could set a bad precedent. “Adding protections to only employment would carve up the statute in a way that’s never happened before and would in a very unprecedented way, send a very negative message about protections for housing and public accommodations for LGBT people and would actively set a preclude those in a way that’s not currently precluded under the existing statutes,” Minter says. Minter points to another version of the plan that would include housing and public accommodations. The 2019 version of the Competitive Workforce Act, known as House Bill 485, is sponsored by Democratic Senator Darryl Rouson and Democratic Representative Jennifer Webb, the first openly gay woman in the state legislature. This expanded proposal has more than 40 co-sponsors from both sides of the political aisle. 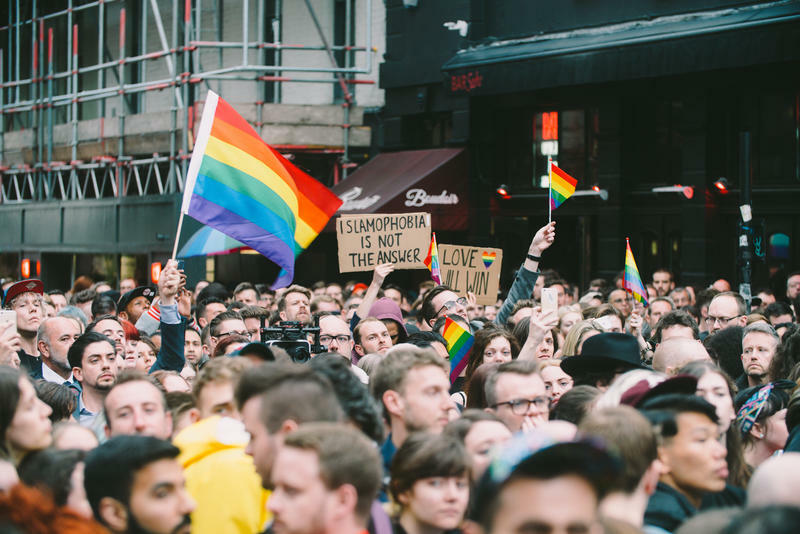 “Protecting LGBT people from discrimination isn’t a red or blue issue. It’s a human issue. This isn’t just the right thing to do, it’s the smart thing to do economically,” says Republican representative Jackie Toledo in regards to the bill at a press conference on February 20th. But Gruters argues sometimes baby-steps are needed for progress to start. “You know, sometimes I tell people that incremental change is almost as good as—You know, you’re not always going to be able to get the whole cake but sometimes you’ll get a slice of cake and if you can make some progress and show people the sky is not going to fall,” says Gruters. Meanwhile, Gruters points to the economic benefit of adding workplace protections noting Fortune 500 companies look at places that have rules in place. Jon Harris Maurer of Equality Florida agrees protections will benefit Florida’s economy, but he says the workers these companies attract still need more than just employment protection. “In terms of attracting and retaining in Florida and we need not just policies that say somebody can’t be fired or not hired because of their sexual orientation or gender identity but also that they will be able to secure housing if they want to move to Florida and bring their family here and that they will be served just like anyone else would be,” says Maurer. The challenge for both bills is getting a hearing from the house and senate. Gruters says he hopes that will come within the next few weeks.